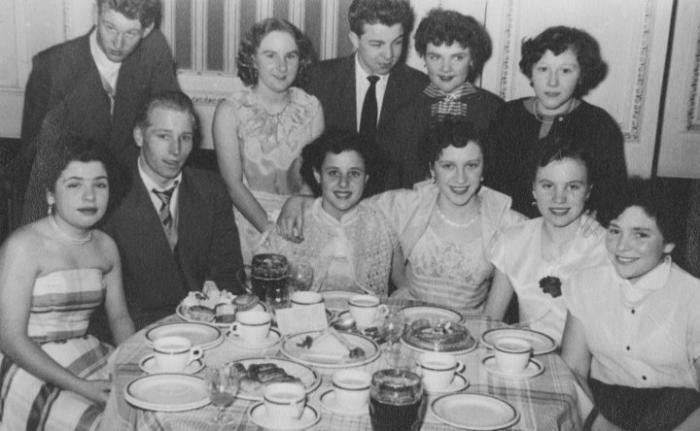 Rita left school at 15 (1954) and worked in a laundry while waiting for a vacancy at Horrock’s. First task – hand sewing; then machinist - making part of garment. They made lovely circular dresses and dressing gowns. Social life; radio and singing; Cutters and packers were women too. Factory closed c.1958/9. Attitude to factory work. Sales of other Horrock’s products too. Union – temperature at factory. Needle through finger. Lorna Leslie (singer - stage name Irene Spetti, David Dickinson’s wife) worked there. Moved to leather factory – 2/3 machinists making school satchels etc. Oiling machines – got impetigo, lack of hygiene and no facilities. No fun there. Stayed there 18 months and then went to Germany with her husband. She became pregnant. Returned and she worked in St Paul’s school as a dinner lady for 38 years. Moira started in Tick Tock after leaving school at 15 (1963?). It was a very Welsh factory. She notes the training; singing at work; holding the eyeglass on her eye; targets; the strain on eyes when making women’s watches. She left to have the children (c. 1970) but returned to work on men’s pocket watches. Then she made clocks for cars at the Enfield factory. At Tick Tock – there was no dust and they wore rubber shoes. The men were on inspection and the apprentices were all male. 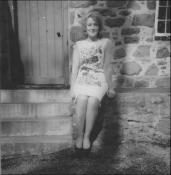 She notes playing tricks on girls and boys who were getting married and on new girls; wearing rollers to go out Friday nights. It was the’ best school’. 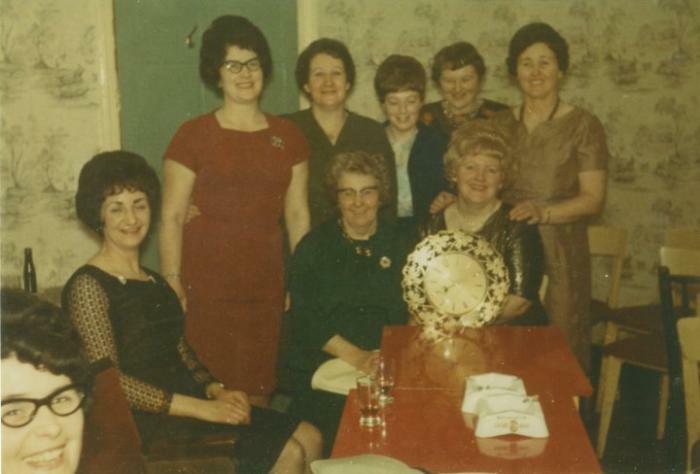 The Club organised trips, Xmas parties for the children and the Miss Tock Tock competition. They had to clean everything when the manager came around. 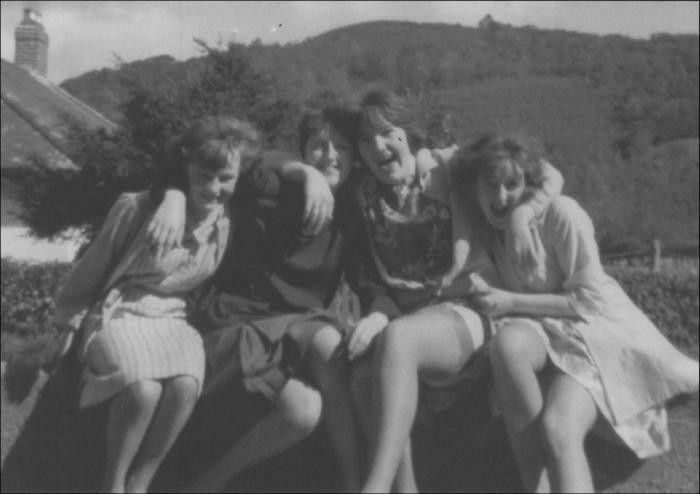 She moved to the car clock factory at Cae’r Bont then (c. 1985) – it was dirtier work. She stayed there 28 years. Mo Lewis and her sister Rosina were the first two sewing machinists for Laura Ashley, working first in Cardwells in Machynlleth, sewing for Marks and Spencers. She moved to Carno when she was 16 to work for Laura Ashley in the original factory and then in the new one, before relocating to north Wales in 1978. She describes Laura Ashley like working with a family, although in the early days the factory was very basic, with the kettle next door to the toilets, and the small workforce did everything, including the cleaning. She said making a dress could take a long time, with several attempts before the design was perfect. She and her husband were lucky enough to buy one of the new houses built by Bernard Ashley for the workers. Mo has always done sewing work, up to today now that she's retired. Sonia’s father (electrician) and mother (machinist) worked at Denex and they were given a pre-fab by factory to live in. Sonia left school at 15 (1956), her father trained her to use machines on Saturday mornings so she got a job in the factory. But Union objected because laying people off – so sent home. Returned in 6 weeks. Lots of strikes and one lock out. Drinking at Xmas and trimmings. Started on patches, on to buttonholing. Made children’s clothing > then Harvey’s making duffle coats; then Clifford Williams and Son. Worked in Smiths, Rhymney too – very strict. Denex - Pilfering bits of jackets to sew at home and cotton reels. Lots of fluff. Radio and singing, record player. If getting married tied to machine. Bond like sisters there. Pierced her ears in toilet. She finished when she was pregnant. She could do every task there. Cutting with the ban knife was dangerous – men’s work. Social life: dances, dinners for children and carnival – Rag Trade float, put on show. Tailor and Garment Workers Union – badge with scissors. Smoke sitting on toilet floor. Needle through finger. Her mother worked until 80 in Denex then LCR components. Reunion of Denex workers ‘We all just cwtshed’. Writing ‘I Love Elvis’ down a trouser leg! Although she passed into the grammar school, May didn't go to it, but left school at 14 (1938). She apprenticed as a dressmaker. During the war she worked in Morris Motors (c.1940-5) � good money, making car radiators. She worked on Saturday mornings 'full of curlers'. The supervisors were very strict � no talking. She had to ask the managers' permission to marry. She married and left. In Morris Motors she wore trousers for the first time. There wasn't a bath in her home. They had fun Xmas time. She worked in Hadfield (a shop) making curtains (c.1958-). She moved to the Folding Doors Factory c.1965 (until ?1968) on the machine stitching the doors. Unions and an accident there. Her husband was a coalminer � he lost his leg. She was made redundant. She describes meeting her husband and her married life. Yvonne worked in Llanrwst toy factory on leaving school at 15, where she painted the wooden toys. She was one of the youngest and worked with two older women she called Aunty Lena and Aunty Martha. She liked the toys, which were well made out of wood, dolls houses and garages and farms, but could never afford to buy them. She enjoyed working there but wanted to earn more money, so she got a job at Dolgarrog Aluminium as an inspector. They made aluminium for lots of things from saucepans to corrugated roofs, and her job was checking for marks on the aluminium before it went to the packing dept. It was a very big factory, over a thousand workers, and she used to get the bus there from Llanrwst. She met her husband there and left the factory when her son was born two years after they married. She did cleaning jobs afterwards but never factory work again. Maureen left school at 15 (1955) and began working at Swiss Embroidery. Sack if spoke and only stayed a week. Moved to Welsh Hills Works Corona Pop Factory. Clogs because of the broken glass - their sound marked out Corona workers..Describes process and how some bottles exploded. Made syrup from sugar- pushing wheelbarrows. Hard work. Also made squash They had ‘unbelievable’ cuts. Singing. Taking pop bottle back for money. Finished there in 1959. Trough to wash bottles. Different flavours. Very cold in winter- cold bottles. Also delivering Smiths Crisps. Social life: YMCA; pictures and dancing. Clothes shops in Porth. Washing hands in caustic soda before factory dance in Bindles, Barry. Left because she couldn’t get leave for her sister’s wedding. Her sister got her a job at the Bellito stocking factory in St Alban’s. Returned to work in Creeds (c.1960-1963), Treforest estate, making capstans; terrible smell. She was in assembly. Rush for buses after work. Her husband worked there too. Very hot. Glenda and Annie left school when they were 14/15. Glenda worked on printing tablecloths in John Patterson’s (c.1953-) and Annie on cutting the material. In Morris Motors Glenda made car radiators for 35 years. The John Patterson factory closed and Annie worked in the battery factory in Pont-henri for some months. She worked in Morris Motors for 32 years. They describe playing tricks there. Glenda was given a special table to work on because she was left-handed. Annie tried for a job with the men on the presses but other workers complained. Xmas parties in the factory. Both had watches for long service. They talk about the gloves, smoking and the smell of cigarettes. In Morris Motors they sold babies’ clothes that they made. Problems with targets – the material was poor. The award ceremony for long service. Glenda left at 58 – a bad back and Annie at 56.